Charles Francois Daubigny came first – and inspired them. In Daubigny, Monet, Van Gogh: Impressions of Landscape on view at the Taft Museum of Art through May 29, you can see hints of the next generation of artists in his landscapes – the use of light and atmosphere, his choices of subject especially orchards and river scenes painted from his floating studio. This is a Big Deal exhibit for the museum and the region, the first major international exhibit devoted to Daubigny’s work, framed in the context of his place and time. The exhibit was years in the making with co-organizers, the Scottish National Gallery (Edinburgh) and the Van Gogh Museum (Amsterdam). Paintings are gathered from major international museums and collectors, (including The Art Institute of Chicago and London’s National Gallery) as well as the three organizing partners of the exhibit. Lynne Ambrosini, Taft Museum Director of Collections and Exhibitions and Curator of European Art and initiating curator of the exhibit, uses three paintings to illustrate a direct line between the artist and the great Impressionists who came after. You’ll see 55 paintings, approximately 40 showcasing a lifetime of Daubigny’s work, from small easel to grand-scale paintings. Galleries are divided by subject: water scenes; orchards and fields; moonlight. Paintings by Claude Monet, Camille Pissarro and Vincent Van Gogh include Daubigny’s garden and his studio boat as well as their interpretation of some locations painted earlier by Daubigny. What Daubigny is famous for: He made real advances in landscape painting, sys Lynne Ambrosini, who points out the artist was the first to use orchards and blossoming trees as subjects. He was also the first to convert a 28-foot river boat into a floating art studio. He brought a new perspective to scenes by anchoring in rivers, forever freeing artists from riverbanks, and his river canvases are his best-known. The Taft Museum of Art is the only U.S. venue for the exhibit, which was years-in-the-making and began with Lynne Ambrosini, who was inspired by the fact that the Tafts bought three paintings by Daubigny. One is on view in the exhibit: Ferryboat near Bonnières-sur-Seine, 1861, oil on canvas. There are dozens of programs and events related to the exhibit including docent and curator tours, afternoon teas, lectures, book talks, and even a plein air landscape painting workshop. Find a list here. Daubigny’s Studio Boat: Life on the Seine is on view through July 3 in the Taft Museum’s Sinton Gallery. It’s a 15-piece series of Daubigny’s etchings, scenes of fishing, cooking, sleeping, and painting are infused with humor and charm, and suggests aspects of Daubigny’s private life and personality. Not need-to-know but fun: On his deathbed, Daubigny is reported to have said: "Au revoir. I go to heaven to see if friend (Camille) Corot has found me subjects for landscapes." This five-foot-wide canvas delighted Parisians who saw it at the annual art exhibition in the French capital in 1857. A young woman rides a donkey through a flowering orchard. She is followed by two young lovers on foot, who are nearly hidden by the vigorous spring growth of the fields. Although the idea of painting blossoming trees seems old hat to us, Daubigny is the artist who first thought of doing it. The French government purchased this painting for the museum of contemporary art in Paris, where the young painters Claude Monet and Camille Pissarro likely saw it. It remained on view for several decades. 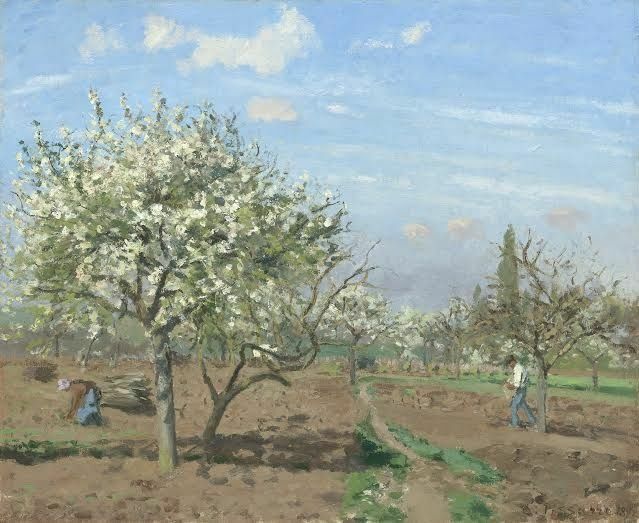 Camille Pissarro, Orchard in Bloom, Louveciennes, 1872, oil on canvas, National Gallery of Art, Washington, D.C.
Camille Pissarro, Claude Monet, and Charles Daubigny all sought refuge in London during the Franco-Prussian War of 1870–71. While there, Daubigny helped the two struggling younger artists by introducing them to his dealer, Paul Durand-Ruel, who became their champion, too. Pissarro returned to France in 1871 to find that the Prussian army had occupied his home and studio and had destroyed most of his paintings. The next spring, he created this bright, freshly colored view of blossoming fruit trees, which probably expressed his relief at the end of the winter and the war, and a sense of renewal and new beginnings. In the early 1870s, both Monet and Pissarro followed Daubigny’s lead in celebrating spring by planting their easels outdoors to capture the delicate colors of sky and blossoms. Vincent van Gogh’s letters to his family included periodic admiring references to Daubigny, whom van Gogh considered a great master. Among his favorite paintings by the older artist was Daubigny’sSpring, which van Gogh studied in the contemporary art museum in Paris. When Van Gogh arrived in Arles (in southern France) in late February, 1888, the fruit trees were just beginning to bloom. For the next two springs, he joyfully painted the flowering orchards of the area, conscious that he was continuing in the footsteps of Daubigny. 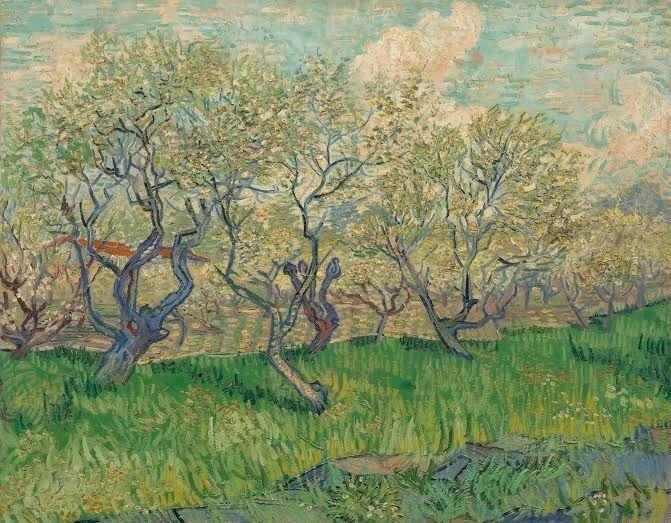 The Van Gogh Orchard that is included in the Taft Museum of Art’s exhibition shows him experimenting with the Impressionist style, painting with lively dabs of color outdoors in order to render the brilliant outdoor light and burgeoning new growth of the season, and even daring to use some colors that one would not expect, such as the purple-blue outlines of the tree trunks. Daubigny, Monet, Van Gogh: Impressions of Landscape, through May 29. Taft Museum of Art, 316 Pike St., Downtown Cincinnati. 11 a.m.-4 p.m. Tuesday-Friday; 11-5 p.m. Saturday and Sunday. Admission Tuesday-Saturday: $15 including entrance to Daubigny as well as the rest of the museum. Youth (ages 6-17) $10, age five and under free. Sunday admission: $5 includes entrance to Daubigny. Youth and children are free. Timed tickets are available at www.taftmuseum.org. Audio Tour: A free audio tour will be available to visitors at www.taftmuseum.org. Printed versions of the audio tour will be available for visitors without smartphones and those who are hearing impaired.